Her hair. Long, highlighted blonde locks. Her healthy hair has a natural shine to it. To stay on-trend and protect her hair from any sun damage, our streetstyle pick today has opted for a leopard print hat. Washing her hair with Control Therapy shampoo prevents her roots from becoming greasy, especially when wearing a hat. Her hair is both protected and nourished from root to tip thanks to her hair care products and uber-trendy hat. What’s more, her choice of headgear allows her hair and scalp to breathe. Her look. Feminine and stylish. The original pattern on her hat instantly perks up the rest of her simple outfit. Continuing with the animal theme, she’s opted for a grey fur skirt in the same shade as her T-shirt and her muted denim jacket. As for footwear, matching leopard print sandals complete her look and tie in perfectly with her statement hat. Tip of the day. Don’t even think about skipping head accessories this summer. Your hair needs the extra protection! Apply an effective sunscreen daily and wear a hat to protect your scalp and skin, which can become dry and damaged due to the sun’s harmful rays. 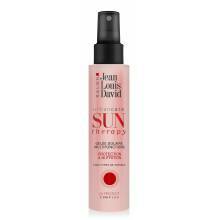 Try using Sun Therapy gel for optimum protection.